Technicaly speaking this is not even a square. It was created as a king's private park - court yard in the middle of the Louvre Palace existing around this space since 12th century. Louvre Museum was opened in 1793 shortly after French Revolution. Space that we can visit today was finally shaped in 1988 after new underground entrance, glass pyramid standing over a new entrance to the main court, the Cour Napoléon, was designed by architect L. M. Pei. Space is huge and consists of a former court park extending all the way to the Place de la Concorde as you can see on our map from 1609 ouside portion of the Lovre castle was still not built. We visited this square in 2012 and noticed [ photo bellow left], how Parisians are cleverly using this space. 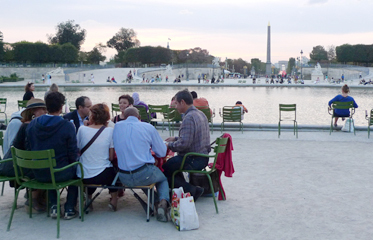 Groups with food and drinks are collecting chairs available everywhere placing them in a space with nice vistas and enjoying themselves! oaa. mraic. aia. ivan martinovic, architect.